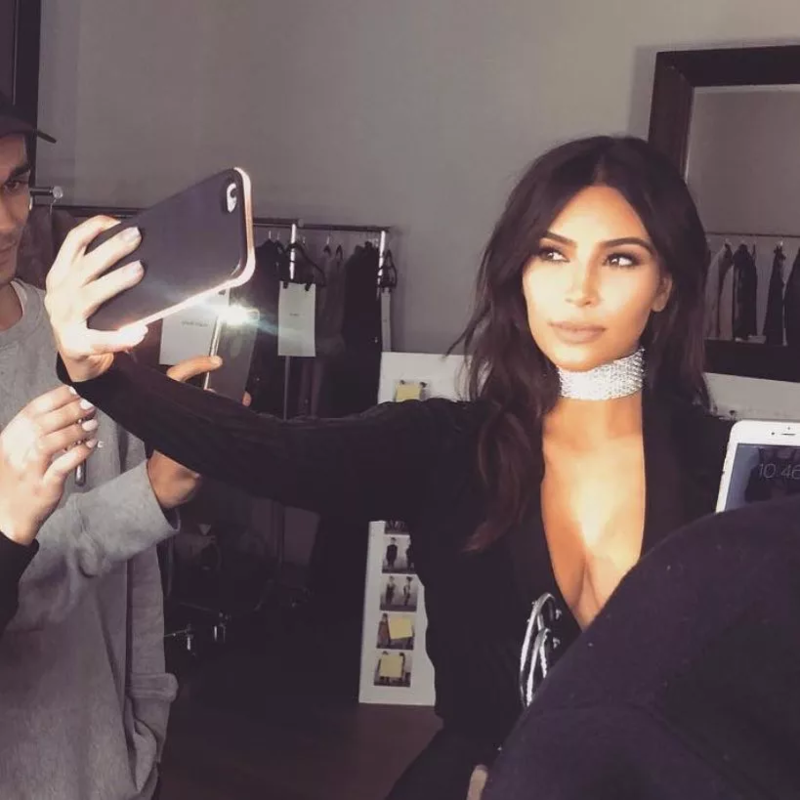 Kim Kardashian with the LuMee phone case in action! ‘What’s in a name?’ A ton of brand power and traffic, that’s what, Romeo. With superstars like Kim Kardashian and Paris Hilton endorsing LuMee, enormous spikes of mobile traffic inundate the website. 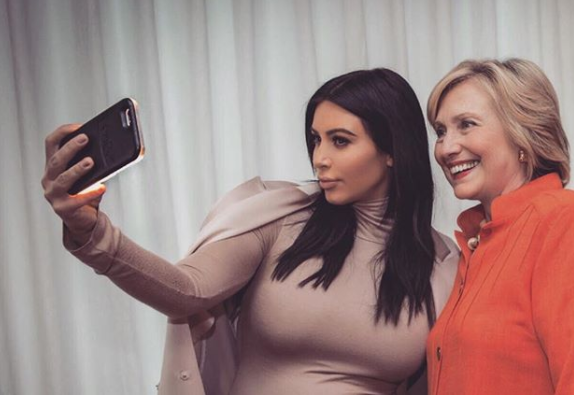 Kim Kardashian and Hillary Clinton take a photo with LuMee. I sat down with their e-commerce Manager, Jeremy Horowitz, to examine how LuMee leverages an incredibly large amount of mobile traffic (80%) to drive sales and email signups. Because of the large percentage of mobile traffic arriving on the LuMee website, Jeremy turned his focus toward creating a fluid and effective mobile experience. To accomplish this, LuMee switched from Privy to Justuno for more flexibility and functionality on mobile. The mobile browsing experience is completely different than that of the desktop. We’re talking smaller screen size, a different interface, and also specific rules that apply to Google SEO. Jeremy was able to identify all of this as an opportunity to improve the LuMee experience. Since the switch to Justuno, LuMee boasts a 41.4% engagement rate for mobile promotions! These are amazing numbers when it comes to mobile traffic conversion. Now, Let’s examine how they achieved such great results. Numbers like this come from two big factors – Design and CRO (Conversion Rate Optimization) Strategy. The focus is always going to be on tightening the funnel as much as possible and valuing the on-site visitor. When coupled with LuMee’s email lifecycle marketing and cart-abandoner stops, their conversion path is airtight. Let’s examine the design and strategy of these promotions. As previously mentioned, a fluid and un-intrusive browsing experience is a primary focus for LuMee. 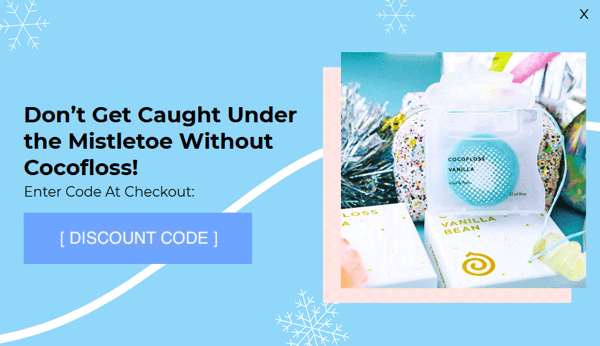 When a visitor attempts to leave the site with products in their cart, a well-branded promotion fires to offer a discount. As examined in our Promotional Marketing Report – visitors, on average, are less likely to abandon a cart after engaging with a Justuno promotion by a whole 5%. In the case of LuMee, they are able to save 41% of lost sales with engaged visitors! On-Brand LuMee mobile popup which is compliant with Google’s policies for popups. Two Large CTAs with a great split of color to drive visitors to interact with ‘Activate My Code’ rather than ‘No, Thanks’. A/B tests show that opt-out text such as ‘No, Thanks’ increase engagements drastically as opposed to an ‘X button’. 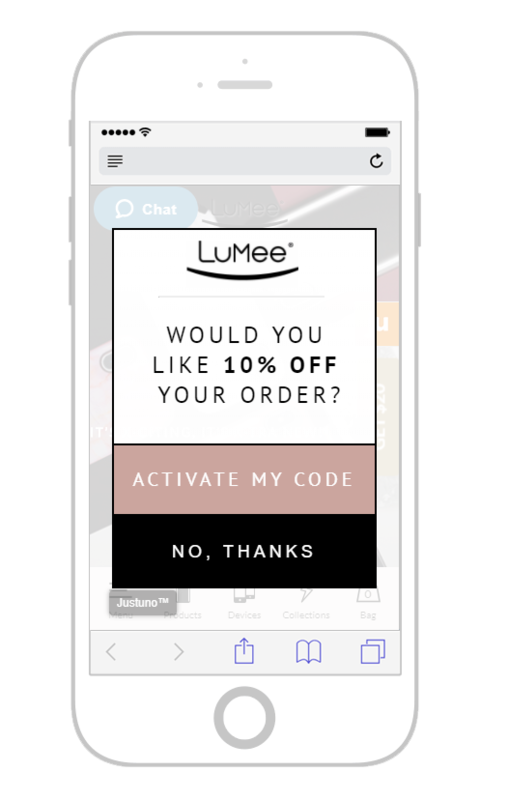 LuMee understands their main traffic source (mobile) and creates CRO strategies around them, hence the optimized mobile exit intent offer. What is a Mobile Exit Offer and how is it triggered? Mobile exit intent offers are promotions intended to capture visitors who are browsing on their mobile device and attempt to leave the site. 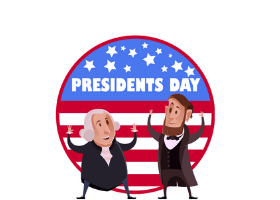 When a website visitor tries to return to the previous page by using the back button, that is the traditional ‘exit intent’ trigger that will fire a promotion. 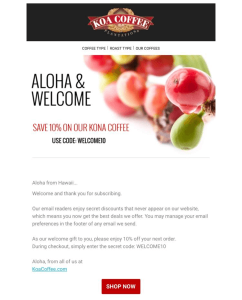 Like the image above, mobile exit intent offers are focused on capturing a mobile visitor from backing out of a website without completing their purchase. LuMee takes it a step further by adding on another type of trigger to capture the unengaged visitors, the idle timer. Understanding that visitors who are idle for longer than 10 seconds are unengaged or could be attempting to leave, LuMee captures a wider audience by firing the mobile pop-up to a wider range of visitors whilst still keeping targeting in mind. Another conversion focused addition leveraged by LuMee is the countdown plugin. 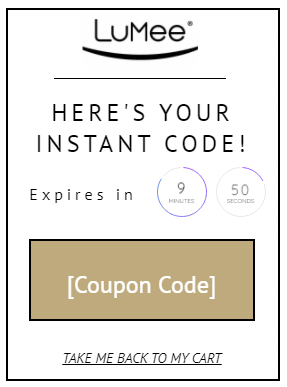 LuMee inserts a countdown timer into the mobile exit intent offer to inspire urgency from the website visitor. Act now! Expires soon! Phrases like this are meant to drive the feelings in consumers and website visitors that have an impact: scarcity and urgency. Countdown plugins are a must have when creating scarcity and urgency. Why was mobile conversion strategy such a big focus for LuMee? Their business heavily relies on mobile shoppers. “…maximizing ROI from huge spikes in mobile traffic from an Instagram post by Kim is a huge focus for us.” said Jeremy. In combination with Klaviyo, LuMee leverages a union between on-site CRO strategy, lead capture with Justuno, and off-site email marketing to create a powerful digital marketing strategy. Jeremy notes that these software create a sort of ‘set and forget’ strategy. 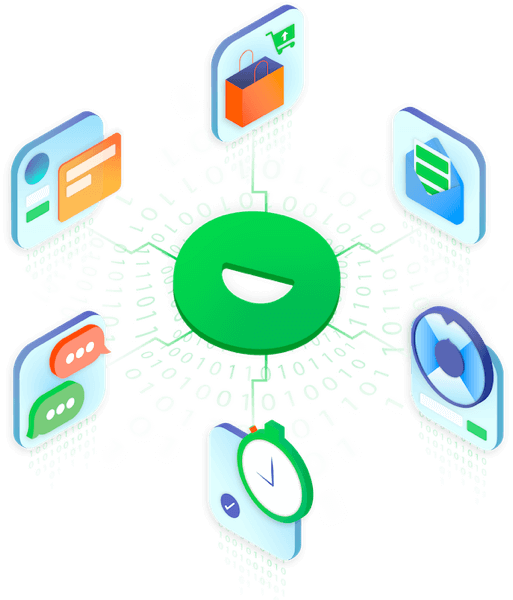 They focus on Justuno and Klaviyo to perform at ‘X rate’ and determine optimization initiatives to increase their conversion rate beyond the average. LuMee is intently focused on optimizing all channels to keep increasing ROI from their traffic. Supermodel Gigi Hadid takes a selfie with the LuMee phone case. With influencers under their belt such as Kim Kardashian and Oprah, who post about LuMee on social media – it’s only natural that the company’s primary goal is to harness every iota of traffic to leverage into a conversion. A big thank you to Jeremy from LuMee for providing great insight for all online retailers! Want to see success like LuMee? Check out other Justuno success stories here!